Superb oversize Photograph, showing Ford examining an automobile engine, signed and inscribed to “Mrs. Cameron” in the light lower portion. The black & white photograph measures 11 inches wide by 14 inches high. 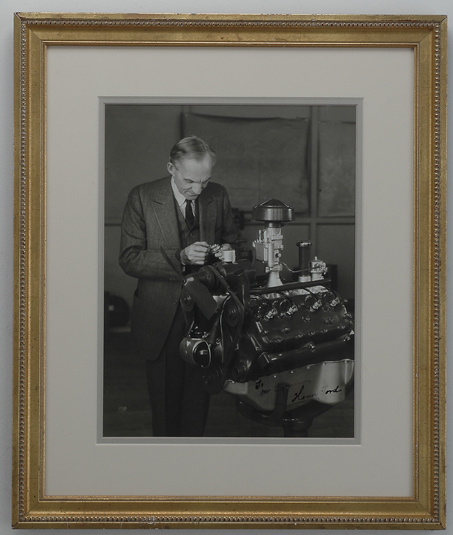 Henry Ford’s aversion to farm work and his interest in mechanical things, caused him to leave home at the age of sixteen to make his way in Detroit. In 1891, he became an engineer with the Edison Illuminating Company (in Detroit); he used the money he made to experiment with combustion engines. These experiments culminated (in 1896) with the completion of his own self-propelled vehicle – the Quadricycle. The Ford Motor Company was incorporated in 1903 (the same year that the Wright brothers flew at Kitty Hawk). Ford realized his dream of producing an automobile that was reasonably priced, reliable, and efficient with the introduction of the Model T in 1908. By 1918, half of all cars in America were Model T’s. Framed dimensions: 17 inches wide by 20 1/2 inches high.